Annotation of Bacterial Genomes and Community Sequences: Genes, Operons, Promoters, Terminators, Protein Sub-Cellular Localization. 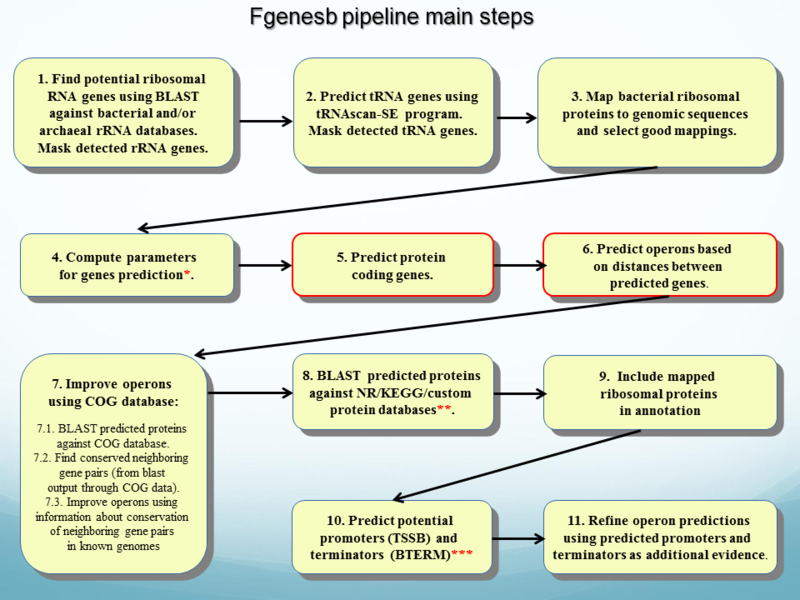 Automatic annotation pipeline Fgenesb ( see flowchart), (445 citation of using in matagenomic projects according to Google scholar), which includes self-training genefinding parameters, prediction of CDS and identification of closest protein homolog from COG, KEGG and NR databases, mapping rRNA and tRNA genes, prediction of operons, promoters and terminators. Suitable for both eu- and archebacterial genomes, and for environmental samples of bacterial DNA sequences. Togenbank: A set of scripts to convert FgenesB output to GenBank and Sequin formats, for visualization in popular viewers like Artemis and for submitting annotated sequences to Genbank. Absplit: A program that sorts bacterial sequences into eu- and archebacterial subsets. BPROM: Bacterial sigma70 promoter prediction program (831 citations according to Google scholar). FindTerm: Finder of rho-independent terminators. ProtCompB: Program for prediction of localization of proteins in bacterial cellular compartments. Bacterial GenomeExplorer: Interactive genome viewer with search capabilities, which lets user to vizualise known and predicted genes, mRNAs, EST, promoters, terminators, and other features. Several programs for alignment and comparison of bacterial genomes. A set of bacterial genome annotation tools listed above was successfully used in first published annotation of bacterial communities (Community structure and metabolism through reconstruction of microbial genomes from the environment, Nature 2004, 428, 37 - 43), and now is widely used in dozens academic and industrial labs for sequence analysis in bacteria. The first, fgenesb pipeline was used to predict coding sequences both on the assembled contigs and the unassembled reads. The second pipeline used a combination of CRITICA and GLIMMER (called here CG pipeline). "Fgenesb correctly identified 10-30% more reference genes on the contigs than the CG pipeline in every data set (Fig. 2a). Both pipelines called 7-15% of the genes inaccurately (Fig. 2a)"
"We also evaluated the accuracy of the gene calls on unassembled reads (where low-abundance species are usually represented). 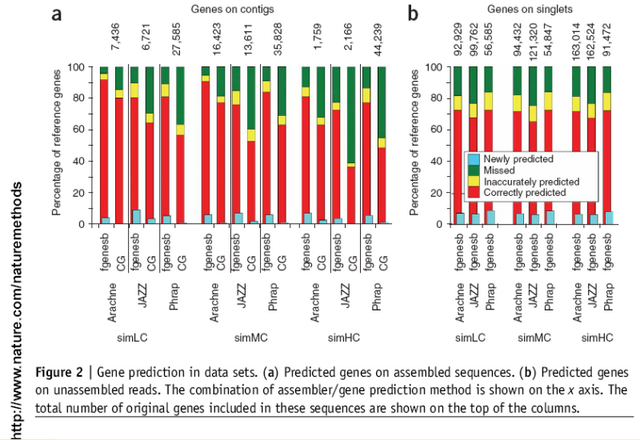 Fgenesb correctly identified ~70% and missed ~20% of reference genes on unassembled reads in all data sets (Fig. 2b). The remaining 10% of reference genes were inaccurately called and another ~8% were newly predicted. Notably, the contribution of assembly to accurate gene prediction was not more than 20%, whereas its effect on the missed and the inaccurately predicted genes was only slightly higher. The CG pipeline exhibited poor results (7% accurately predicted, 85% missed and 8% inaccurately predicted genes), and we did not use these data for the following steps of the analysis". Sn (Sensitivity), percentage of existing CDS predicted exactly right. Sn_ov, percentage of CDS predicted exactly and with overlap. For B.subtilis, we compared genes predicted by three programs with all annotated genes in GenBank entry for that genome. FgenesB: Journal of Bacteriology (2008) 190, 4859-4864; Journal of Bacteriology (2008) 190, 3646-3657; Journal of Bacteriology (2008) 190, 3362-3373; Journal of Bacteriology (2008) 190, 2777-2789; Microbiology (2008) 154, 1422-1435; Nature Methods (2007) 4, 495-500; PNAS (2007) 104 ,29, 11889-11894; Nature Biotechnology (2007) 25, 447-453; PNAS (2007) 104 ,13, 5590-5595; Nature Biotechnology (2006) 24, 1263-1269; PNAS (2006) 103, 34, 12897-12902; Journal of Bacteriology (2006) 188, 14, 5228-5239; Microbiology (2006) 152, 1951-1968; Molecular Microbiology (2006) 61, 4, 960-977; Nature (2006) 439, 847-850; PLoS Biol (2006) 4,4 e95; Science (2005) 308, 554-557; Nature (2004) 428, 37-43. BPROM: Journal of Bacteriology (2008) 190, 4559-4567; Journal of Bacteriology (2008) 190, 3877-3885; Journal of Bacteriology (2008) 190, 2096-2105; Microbiology (2008) 154, 1719-28; Microbiology (2008) 154, 1372-83; Infection and Immunity (2007) 75, 9, 4506-4513; Journal of Bacteriology (2007) 189, 2, 351-362; Cellular Microbiology (2007) 9, 4, 1039-1049; Journal of Molecular Biology (2007) 368, 4, 966-981; PNAS (2006) 103, 34, 12897-12902; Journal of Bacteriology (2006) 188, 14, 5089-5100; Applied and Environmental Microbiology (2006) 72(4), 2539-2546; Molecular Microbiology (2006) 59, 2, 541-550; Applied and Environmental Microbiology, (2006) 72, 1, 368-377; Journal of Bacteriology (2006) 188, 2, 789-793; FEBS Journal (2005) 272, 24, 6324-6335; Infection and Immunity (2005) 73, 5, 2899-2909. FindTerm: Microbiology (2008) 154, 1422-1435; Journal of Bacteriology (2008) 190, 3646-3657; Microbiology (2007) 153, 2148-2158; Infection and Immunity (2007) 75, 9,4482-4489; Enzyme and Microbial Technology (2007) 4, 5, 747-753; Journal of Bacteriology, (2006) 188, 1, 160-168; Molecular Microbiology (2006) 59, 2, 541-550; Journal of Bacteriology (2006) 188, 1, 202-210; Journal of Bacteriology (2006) 188, 1, 160-168.